"This is an easy and delicious recipe for a turkey that is perfectly browned on the outside while being both tender and juicy on the inside!" 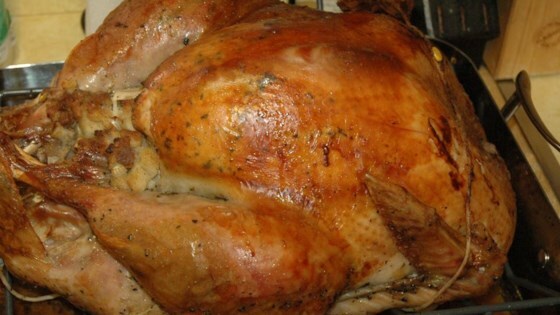 This tender, herb roasted turkey is simple, easy, and perfect for the holidays! The turkey looked fabulous, smelled like heaven but it just didn't do it for me. My family and I are such 'skin' people... not that great, sorry. This was so easy, no basting! And it was very moist. However, the skin did not brown under the tin foil, so next time, I wil take the tin foil off about an hour before it is done.